The Democrat raised more than $832,000 during her first three months in Congress — a substantial haul that puts her ahead of other House members in Minnesota’s delegation and several other closely watched freshman Democrats. About half of Omar’s first-quarter haul came from individuals who contributed $200 or less — one measure of grassroots financial support, new filings with the Federal Election Commission show. CNN has reached out to Omar’s office to request comment. 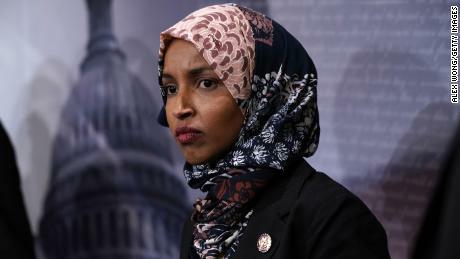 Omar, a Somali-American and one of just two Muslim women serving in Congress, has become a polarizing figure in Washington and faced criticism for controversial remarks related to Israel, including charges of anti-Semitism from Republicans and some Democrats. She publicly apologized in February after a backlash from both sides of the aisle for comments she made on Twitter that appeared to suggest that support for Israel in Congress is fueled by money tied to the American Israel Public Affairs Committee, often short-handed as AIPAC, a prominent pro-Israel group. At the same time, however, progressives have embraced and championed her as an important voice within the Democratic Party, raising concerns for her safety and arguing that she faces a different standard as a Muslim and woman of color. Larger donors to Omar’s campaign this year include the campaign committee of South Carolina Rep. James Clyburn, a member of the House Democratic leadership. He donated $1,000 at the end of March. Omar’s fellow freshman and one of her most vocal defenders, New York Rep. Alexandria Ocasio-Cortez, also contributed $2,000 to the Minnesotan’s campaign in late March, Federal Election Commission finding show. Ocasio-Cortez recently called on other members of Congress to defend Omar and raised concerns over the congresswoman’s safety after President Donald Trump posted a video to Twitter juxtaposing imagery of the September 11 terror attacks with footage of the congresswoman making a speech in which she referenced the attacks. 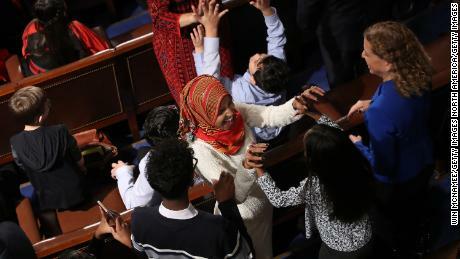 The President’s video has been widely denounced by Democrats as an incitement against the congresswoman and Omar has said that there have been an increase in threats on her life in the wake of the tweet. Omar’s first-quarter figures push her ahead of some other freshman Democrats raising substantial sums ahead of tough re-election races. For example, Rep. Antonio Delgado, who defeated a Republican to capture an Hudson Valley, New York district in 2018, raised a hefty $755,000 during the first quarter. California Rep. Katie Hill, who unseated a Republican in Southern California last year, raised more than $600,000. Omar’s fundraising exceeded even that of the high-profile Ocasio-Cortez, who raised more than $726,000 during the January-to-March fundraising period. If she keeps up the fundraising pace, Omar likely will quickly surpass the $1.08 million she collected during the entire, two-year election cycle in 2018. CNN’s Sunlen Serfaty contributed to this report.